Here’s a Tangzhong bread recipe requested by many of my fans. Finally, you got it. If you tried making Tangzhong bread, this one won’t be too difficult at all. Please bear in mind that as wholemeal flour is added, you hardly knead the dough to the stage that can pass the windowpane test. Yet, by using this formula, you can still bake a bread loaf that can be kept soft for days. I used the baking tin lid to make a perfect square loaf this time. If you don’t have a lid for your tin, it’s fine. Nothing can hinder you from enjoying lovely, soft and healthy wholemeal toast for breakfast. Select the “dough” mode (refer to the manual of your breadmaker to select the kneading dough programme). When all ingredients come together, add the butter (see picture 1). Knead until the dough becomes elastic. Let the dough complete the 1st round of proofing, until doubled in size, about 40 minutes. Transfer the dough to a clean floured surface. Deflate and divide into 3 equal portions. Knead into ball shapes (see picture 2). Cover with plastic wrap, let rest for 15 minutes at room temperature. Bake in a pre-heated 170C / 335F oven for 30 to 35 minutes. Remove the loaf from the oven and tin. Transfer onto a wire rack and let cool completely. Slice to serve or place in an airtight plastic bag or container once it's thoroughly cooled. Please refer to this recipe to make the Tangzhong. Just measure out the quantity you need. As wholemeal flour is added, it’s very hard to knead the dough until it passes windowpane test. Just knead it until it’s very elastic. When you try to stretch the dough into a thin translucent membrane (i.e. a windowpane), it’d be broken into an irregular hole. It’s done. Don’t ever over-knead it. Concerning Tangzhong, you might like to take a look at this post. It might help. Great! Many thanks for granting our request. I have been searching for a soft wholemeal bread receipe! Will definitely try soon! Tks! You're welcome. Hope you like it. Btw, would it be as good if I use the bread maker to bake too? You can put all the ingredients into your breadmaker, then turn it on, leaving it until finish baking. If you don't mind the crust would be a bit thicker and harder than those from oven, it's a fantastic and handy way to make a loaf. 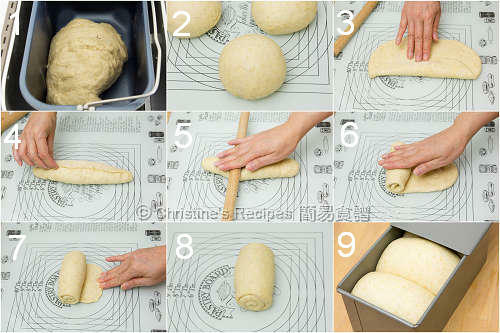 Hi Christine, can you tell me what happen if the dough over knead? It's very difficult to over knead a dough by hand because your arms would fatigue well before that stage is reached. So, if you use a mixer, you have to check the dough out every now and then. The over-kneaded dough will be very tough and you'll get flat and heavy bread as a result. This is a receipe that 'really' work! My loaf is so soft and fluffy, thank you for sharing the details. I always tried to make this at home but can't made it.. but i think your recipe will help me a lot.. i will really want to give u thanks for this recipe as i was searching for this for a long time..
Hey Christine , I've made 3 braided bread using your recipe . It's one of the fluffiest bread I've baked using elbow grease ! lol I've also baked the Japanese style bacon and cheese loaf bread and as you've said it , really really sticky so the 2nd attempt , I've sub it with some whole wheat flour and it turned out really great :D Thank you so so much for sharing this recipe ! Should i use top or bottom heat for baking this bread? My oven doesn't have the function to control the heat elements separately. I just put the bread in the middle rack. If I were to make two loafs, can I just double the ingredients in the recipe? Yes, simply double all the ingredients listed in the recipe. Hi Christine! I've tried your bacon and cheese, pai bao, and butter cookies :D they were absolutely fabulous! I'm wondering if I can add some bananas into this recipe since I'm craving some banana bread and I dont have self rising flour nor baking soda. Glad that you loved my recipes. Haven't tried adding bananas into this recipe. But I'm afraid that the end results would be too dense or moist. I haven't tested this recipe without eggs. But why not? Many bread recipes don't need eggs. You can simply skip the egg. Cool. I will try it and let you know how it turns out. Thanks ! Hello Christine, I just want to check if the milk is 110gm or 110ml. Thanks. Love your bread recipes! This recipes calls for 110 grams of milk, about 130ml. 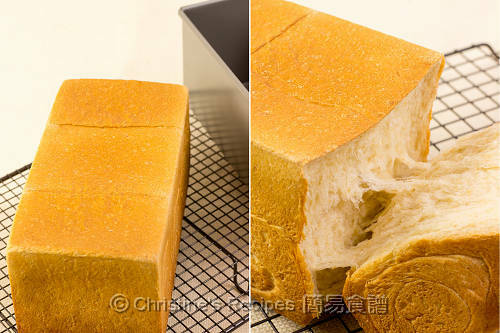 What bread pan did you use in the pictures? I have a pullman 13x4x4 but it makes really small slices. Thanks for sharing your recipes! They are delicious!! Hi Christine, I tried and absolutely loved your milk toast recipe and am keen on trying this whole wheat version. One of the things I liked most about the bread is its sweetish milkiness and so was wondering if I could add milk powder to this recipe as well and if so, then upto how much would be acceptable. Do let me know. Thanks. 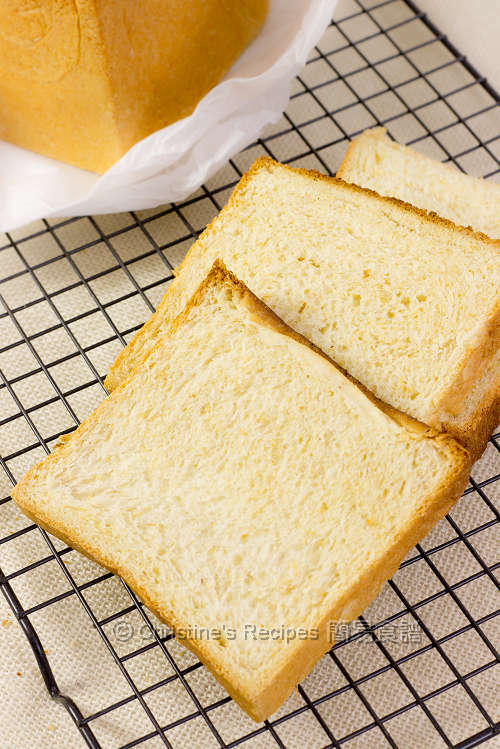 You can add 1½ to 2 tablespoons of full cream milk powder to enhance the bread with milky fragrance. Sure, you can leave the dough inside your bread machine, from the start until baking as long as you don't mind the crust is thicker and harder. I have a few quetions. Do I have to use a bread maker to make any of the tangzhong loafs? If I don't have to use a bread maker, could you please tell me how I would make the Hong Kong Sweet Buns and this Wholemeal Loaf please. I tried to make the Hong Kong Sweet Buns and it was a complete disaster. The dough didnt become a dough and it was all sticking to my hands. what do you think I did wrong? The tangzhong dough is far sticky than the regular dough. It's quite hard to knead by hand, and very tedious, so I use my breadmaker. But it's still possible to make it by hand, it only needs more effort, time and patience. I tried your whole meal loaf and your pai boa today! The dough was incredibly sticky for both loafs and I ended up adding about one cup extra bread flour so I could knead the dough. When the bread came out of the oven, it wasn't soft and fluffy like yours. Do you think the additional flour could have caused that? Or did I not knead enough? Hi Christine, this bread looks amazing. I tried making it and the pai bao today. The dough was really sticky. I didn't have a bread maker so I kneaded it by hand. It was too sticky to work with so I ended up adding a ton more flour so I could work with the dough. Both loafs of bread didn't come out soft and fluffy like yours did. Would it be because of the extra flour? Or that I didn't knead enough? This pai bao dough is quite sticky and hard to knead to pass the windowpane test by hand. Having said that, some of my fans still managed to succeed in kneading this dough by hand. When kneading, you can sprinkle a bit of extra flour to prevent from sticking, yet try not to add too much flour, coz it'll hurt the end results. Hmmm, given by your info, the problem you mentioned could be not enough gluten generated by kneading. I'll try not to add to much flour. If I don't add that much flour though its too sticky to knead. What should I do? How long do you think I should knead the dough for? The time of kneading depends on how fast and hard you knead. Normally, it takes about 25 minutes. The dough should be kneaded until the surface is not sticky to hands at all. I tied your wholemeal loaf and pai bao again today, and it turned out amazing. So soft and fluffy! I really like milky flavors, but I can't find any milk powder except for skim milk powder in any of the stores. What can I use instead?? Glad that you liked my recipe. You might replace the wheat flour to bread flour if you want to bake a white bread loaf. I have made your bread and it is so very good. I want to know if you have ever considered making video's on U Tube. I would watch every one that you make. This bread recipe, and all of them for that matter, would be a big hit. at home instead of buying from shop? Why? It's very handy to use the store-bought flour. I tried your recipe today. It come out pretty good. Can I reduce the sugar? Thanks for sharing your recipes! Sure, you can reduce a bit of the amount of sugar. Hi Christine, I'm wondering what kind of knife will be good to cut this loaf? Do we cut when it's completely cool? TIA! It's better to wait until the bread is completely cool, and then cut with a long knife with serrated edge. Your tang zhong recipes look amazing, I can't wait to try this wholewheat loaf. I was wondering about the oven temperature and baking time. Since I have a fan oven would I have to lower the temperature even further, say to 155C? Maybe it's part of the tang zhong method to bake on low temperatures. I have to learn more about it! Thanks for your lovely recipes. Love this recipe! Mine came out perfect!! !Please could you post a banana wholemeal loaf recipe made with tangzhong starter. I love bananas so much:D tnx!! knead for a few seconds, rest for 10 mins, repeat twice, rest for 30mins. I use this method for all other bread recipes. Not sure. Haven't tested the autolyse method with this recipe. Hi, do we really need tangzhong? is there a bread recipe where it is not required for tangzhong? I fail in making tangzhong in all my attempts =\. I think my Grandpa love this kind of bread. He bought some bread that looked exactly like this today! I would love to make him fresh bread to eat instead of traveling to Chinatown that takes at least an hour to get. Hi Christine, I just wanted to say thank you very much for sharing this. I've created many other version of bread for my mum using this basic wholemeal recipe! I just tweaked and add other ingredients like multigrains, cranberries, etc! Glad that you liked my bread recipe. Can I use the bread machine for the whole process? Sure, you can, only if you don't mind the crust being a bit thicker and harder.